Opera-goers streaming out of La Scala in Milan on Thursday night turned on their phones to discover that Italy finally seemed to have a new government. The opera they had been watching, Aida, ends with the doomed lovers dying together, while locked in an underground prison. Some members of Italy’s new government might see that as an apt symbol of their country’s fate inside the European single currency. Paolo Savona, who will serve as Italy’s Europe minister, has described the euro as a “German cage”. However, Italy’s new administration has now promised to stay inside the cage for the foreseeable future. In fact, the coalition between the League and the Five Star Movement was only accepted by Italy’s president once the europhobic Mr Savona was blocked from taking up the even more sensitive job of finance minister. In a further sign that the League is backing away from its longstanding flirtation with leaving the euro, a road sign proclaiming “Basta Euro” that stood outside the party’s headquarters was painted over last week. For students of European politics, all this looks familiar. A populist government has once more been forced back into EU orthodoxy, by a combination of Brussels, Berlin and the markets. The only novelty is that this time it happened even before the new Italian government had sworn in. The EU’s critics have long argued that this pattern illustrates that the bloc is, at heart, undemocratic. Mr Savona made this case in a recent book, claiming that the Italian government led by Silvio Berlusconi was brought down in 2011 by Franco-German pressure and that this was “an undemocratic act typical of the philosophy that dominates the EU’s actions”. This argument has been made with increasing frequency in southern Europe, as the euro crisis has developed. Yanis Varoufakis, the former Greek finance minister, has likened the EU and the IMF’s pressure on the government of Cyprus in 2013 to a “coup”. In Mr Varoufakis’s mind, this was a rehearsal for the successful financial and economic pressure that was placed on Greece to reverse course after the country had voted to reject the terms of an EU bailout in 2015. This debate over whether the EU is anti-democratic is bound to resurface in Italy. Even if the Italian government steers clear of any effort to leave the euro, it still seems likely to clash with the EU authorities over both fiscal policy and immigration. Matteo Salvini, the League’s leader and Italy’s new interior minister, has promised to speed up deportations and detentions of up to 500,000 illegal immigrants — which could cause angst in Berlin, as well as potentially violating EU law. The League also wants a flat tax of 15 per cent on income. Five Star, its coalition partner, has argued for a universal basic income. Those policies together are a recipe for blowing up the EU’s 3 per cent limit on national budget deficits. If the government in Rome ignores the EU’s fiscal rules, the reaction from Brussels and Berlin will be harsh. When Italy then finds itself under pressure from the bond markets, the likes of Mr Varoufakis and Mr Savona will return to the argument that the EU elite is conspiring against the will of the people. The crude version of this argument does not make much sense. The biggest constraint on Italy’s freedom to cut taxes and boost spending is the level of the country’s debts rather than the EU’s rules. Italy’s debt stock is over 130 per cent of gross domestic product. In absolute terms, it is the third-largest in the world, after the US and Japan. Any sense that Italy is giving up on fiscal discipline — or, even more dramatically, planning to return to the lira — would probably provoke an Italian debt crisis, regardless of the statements of the EU. But there are other aspects of euro membership that really do restrict Italy’s freedom to run its own economy. By joining the euro, Italy lost the ability to devalue its currency to restore competitiveness; or to stoke inflation to erode the value of its debts. Some would argue that these were bad habits that Italy needed to get rid of. But after a decade of weak economic growth, many Italians look back with nostalgia to the “bad old days” of inflation and devaluation. However, those policies could only be returned to if Italy left the euro. And any effort to do that and return to the lira is likely to provoke capital flight from Italy — and a financial crisis. In that sense, the euro is a “cage”. But the cage is inherent in the original design of the currency. The EU’s fiscal rules are merely an additional feature. What is more, the Germans are also locked in the cage alongside the Italians. While the German economy has clearly prospered mightily, compared with the economies of much of southern Europe, Germany’s future is inextricably bound up with that of its less fortunate neighbours. A financial crisis provoked by the break-up of the euro would not be contained to southern Europe. German banks and savers would swiftly find themselves at risk. The resulting economic conflagration might well destroy not just the single currency, but the EU itself — and with it more than 50 years of German foreign policy. At that point, the appropriate opera would not be Verdi’s Aida, but Götterdämmerung by German chancellor Angela Merkel’s favourite composer, Richard Wagner. The chairman of the Federal Reserve, just four months into his term, could be in the uncomfortable situation this week of signaling that a recession is coming. The Fed seems all but certain to raise its target range on overnight rates by a quarter point for the second time this year on Wednesday. There is a good chance it ups its estimate for total rate increases for 2018 from three to four. The Fed’s last set of projections, in March, showed that policy makers on balance expected to raise rates three times. But nearly half of them reckoned on four rate increases, and the unemployment rate has since fallen from 4.2% to 3.8%, which is where policy makers thought it would be at end the year. Inflation has gotten a bit warmer. The difference between three and four rate increases may not matter much to investors, who expect rates to keep rising next year. But it matters a lot for the yield curve, which is edging closer toward inverting, the situation where short-term rates are higher than long-term rates. That is a longstanding signal that a recession is coming. The yield on the two-year Treasury, which reflects investor expectations of what overnight rates will average over the next two years, has climbed to 2.5% from 2.31%. The 10-year Treasury yield of 2.94%, on the other hand, is basically level with where it was in March. 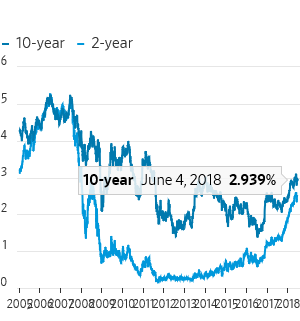 That has taken the yield curve, as measured by the difference between the 10-year and two-year Treasury yields, to just 0.4 percentage points—the smallest gap in over a decade. And it has taken it that much closer to inverting. The yield curve last was inverted in 2007, just before the recession. It also inverted in 2000. Federal Reserve Chairman Jerome Powell, when he holds his press conference on Wednesday, may be asked to explain why a recession won’t follow if the curve inverts again. He may answer that this time is different. Many policy makers believe the low level of long-term rates around the world now are residual effects of central bank bond-buying programs rather than rate expectations. Higher rates in the U.S. have made Treasurys attractive to foreign buyers, keeping rates low. Further, Goldman Sachs economist Jan Hatzius points out that an inverted yield curve isn’t the cause of recessions so much as the result of the Fed trying to keep the economy from overheating. The Fed can’t hold off on rate increases it thinks are necessary just because of what the yield curve is doing. That risks falling behind and then raising rates even more aggressively later, and making the yield curve invert even more. Mr. Powell may have a lot of explaining to do. If last year in markets was all about strong returns, this year is about rising risks: a brewing trade war, renewed political turmoil and concerns about growth. The difference is that central-bank policy that helped insulate markets from risk is changing. Investors are increasingly looking after themselves. Last week’s wild swings in Italian bonds are just the latest in a series of shocks that have made 2017’s smooth market ride a distant memory. Surging Treasury yields, equity-market volatility and trouble in Argentina and Turkey are all part of the same picture. 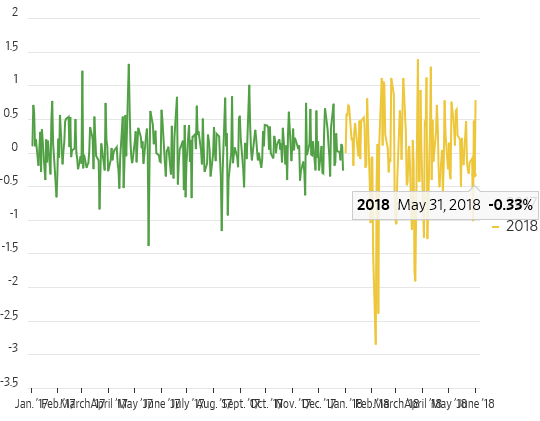 These have been episodes where the moves in financial-market prices have become news themselves—something that hardly happened at all in 2017, and a sign of their sheer scale. 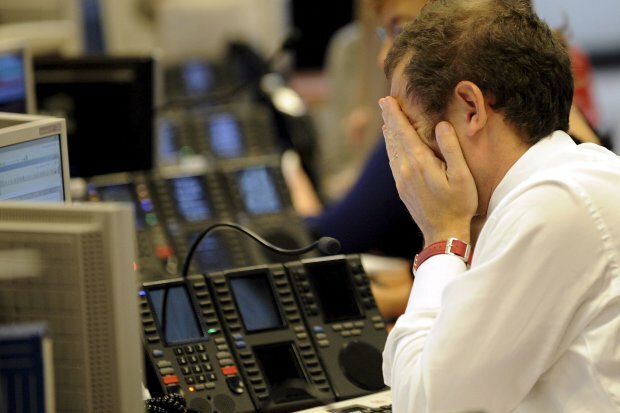 In financial jargon, risk premia are being repriced. In everyday terms, investors are quicker to sell and are starting to pay up for protection in an environment where central banks, whose policies have pushed them to take risk, no longer have their backs. In 2017, the biggest one-day decline for the MSCI All-Country World index of developed- and emerging-market stocks was 1.4%, and only on two days did it fall by 1% or more. This year already the biggest drop is 2.9%, and 11 days have seen declines of more than 1%. 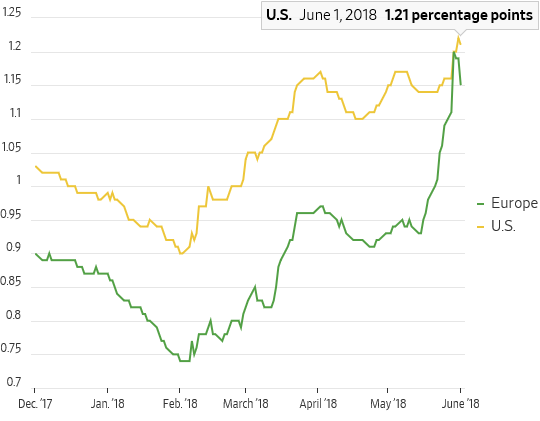 Meanwhile, the gap between investment-grade corporate-bond yields and yields on safer government bonds in both the U.S. and Europe has been widening steadily since early February, a further sign that investors are demanding extra compensation for taking risk. 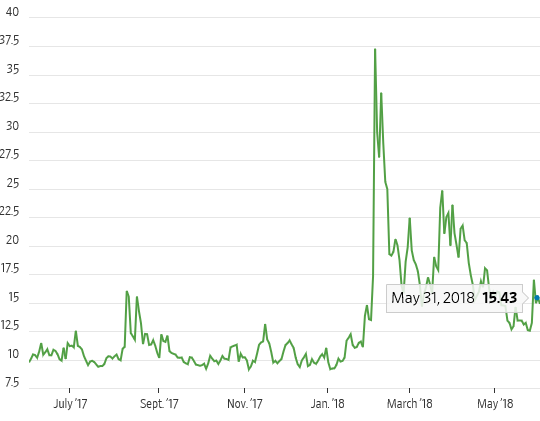 The VIX index, a measure of expected U.S. stock-market volatility, has also averaged 16.7 this year, higher than any of the peaks recorded in 2017, when the full-year average was 11.1. With the global economy solid and inflation rising, the days of central banks doing “whatever it takes” are in the past. The Federal Reserve is raising rates while there is no sign of the European Central Bank further loosening policy. Previously, bad news came with the silver lining of a potential policy response, but now good news brings the prospect that policy will be tightened. Higher rates for U.S. Treasurys in particular create competition for riskier bonds and stocks. The low-volatility environment made it more profitable to invest without paying for insurance against downswings in markets, notes UBS . That exaggerates the reaction to events like last week’s Italian saga or to signs that the U.S. will enter a deeper trade war with its allies and rivals. Morgan Stanley ’s strategists call the change “the end of easy” for markets. That doesn’t spell the end of returns, as long as global growth holds up. But it will require investors to be more nimble, and, after a long period when much went right, think more carefully about what might go wrong. U.S. shale oil drillers are boosting efficiency with giant pads and walking rigs, lowering prices to a point that could hurt exporters like Saudi Arabia. The efficiency gains mean that even an epic price decline won’t halt activity at the best fields. What’s more: The industrial scale of U.S. drilling means that companies able to write big checks and handle complex logistics are driving the market. They are less likely to feel true financial distress during the next pullback. 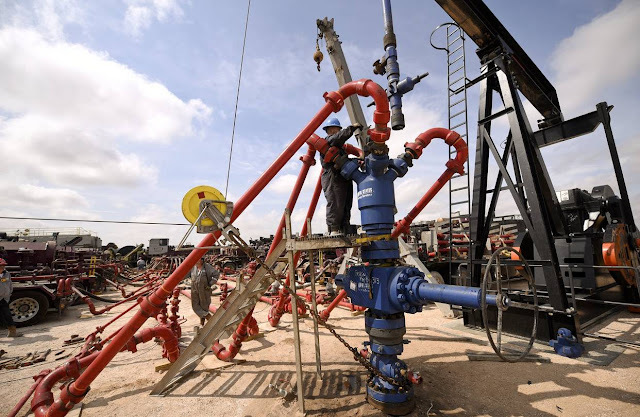 Producers reckon that the core of the Permian is still profitable in the high $30-to-mid-$40-a-barrel range for U.S. benchmark crude, now trading around $66 a barrel. According to the International Monetary Fund, not a single Middle Eastern OPEC country can finance its budget at Brent crude below $40 a barrel. OPEC, a cartel out to maximize its profit, talks a lot about bringing “balance” to the oil market. The bust they helped engineer left that balancing point at a price they will find it hard to live with. LONDON – “An investment in knowledge pays the best interest,” wrote Benjamin Franklin. A fervent advocate for public education, and a founder of libraries, schools, and the University of Pennsylvania, Franklin viewed education as the foundation of human progress. If he were alive today, he would be horrified by the state of education in developing countries – and he would most likely be backing the International Finance Facility for Education (IFFEd) proposed by the International Commission on Financing Global Education Opportunity, led by former British Prime Minister Gordon Brown. In an increasingly knowledge-based global economy, quality education is more important than ever. Yet the world is facing an education crisis. Some 260 million children are not even in school. More than twice that number are in school, but learning so little that they will emerge without the basic literacy and numeracy they need to flourish. This is not only destroying the hopes of young people; it is impeding the progress of entire countries – and thus of the world. Three years ago, world leaders committed to Sustainable Development Goal 4, which calls for the provision of inclusive and equitable quality education for all by 2030. Yet, if current trends continue, more than 800 million children will fall short of that target. Given the importance of education for virtually every meaningful indicator of development – from child survival to maternal health and poverty reduction – this failure will spill over to other SDGs. Under-investment is at the heart of the education crisis. Failing to recognize the very high returns on offer, developing-country governments invest, on average, just 4% of national income on education. Even if they raised that share to 6%, the global financing deficit would amount to $40 billion per year, and rising, by 2020.
International development finance has a crucial role to play in narrowing the gap. The modestly good news is that, after six years of stagnation, aid to education rose in 2016. The bad news is that the share of education in overall aid has been shrinking – and too little aid goes to basic education in low-income countries. But it is not just the poorest countries that need help. The financing shortfall also affects the 53 lower-middle-income countries (LMICs) with incomes between $1,000-$4,000. These countries – ranging from Bangladesh and Zambia to Indonesia and the Philippines – account for almost 500 million of the children who will not be learning by 2030. Many LMICs are trapped in a financial no man’s land. As their incomes rise, they receive less of the interest-free grant aid earmarked for the poorest countries. But they are unable – or unwilling – to draw on other development finance, notably loans from the World Bank and regional development banks. These loans are provided on far more favorable terms than most LMICs could secure on world markets, thanks to the World Bank’s credit rating. Part of the problem is that developing-country governments are not demanding finance for education. Most prioritize loans for physical capital, like transport and energy infrastructure, over human-capital investments like education. This is plain bad economics: Countries with first-world roads and bridges but fifth-rate education systems are heading nowhere fast in terms of long-term economic growth and human development. The World Bank itself has also attached too little weight to education. Just 5% of its loan portfolio is directed to the sector – and most of that goes to a handful of wealthier middle-income countries. To his credit, World Bank President Jim Yong Kim is now openly challenging governments that neglect investments in their citizens. He has announced the creation of an index that will rank countries on their investment in human capital. 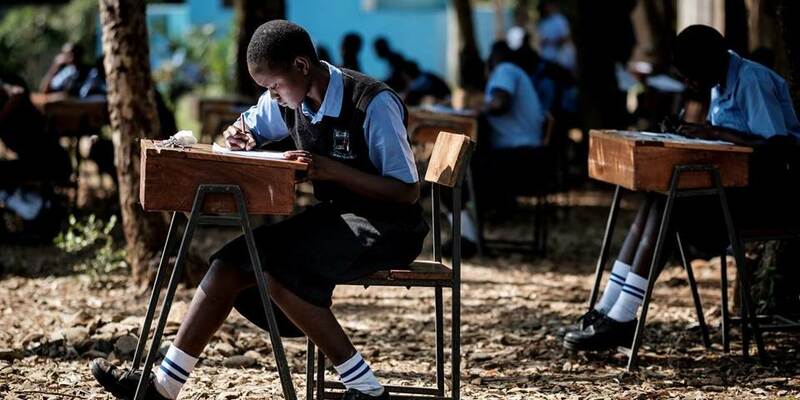 The World Bank must now work with governments to ensure that more of its $50 billion lending portfolio goes to education – and regional development banks should follow suit. The IFFEd could help catalyze change. Specifically, it would create a new facility designed to underwrite education loans from the World Bank and regional development banks. Because the World Bank’s credit rating enables it to advance around $4 in lending for every $1 in reserves, $2 billion in guarantees could mobilize $8 billion in financing for education. The new facility would also include a grant program to subsidize a reduction in interest rates from hard-loan to affordable soft-loan terms. Critics worry that IFFEd-sponsored loans would create unsustainable debts – but that concern is misplaced. Some developing countries, notably in Africa, are drifting toward a renewed debt crisis. Weak revenue collection, lax budgeting, and reckless borrowing in hard currency at high interest rates on sovereign bond markets have all played a role. But the policy antidote is an increase in government revenue – notably, by cracking down on tax evasion and avoidance – and measures to reduce high-interest debt. Rejecting highly concessional education finance in the name of fiscal consolidation is the prescription for a cure that would kill hope and opportunity. It would starve education of resources and place the burden of fiscal adjustment on the backs of children on the front-line of the education crisis, undermining economic-growth prospects and fueling inequality in the process. That is exactly what happened under the International Monetary Fund’s approach to the debt crisis of the 1980s, when structural adjustment programs forced massive cuts in spending on education and health systems. The IFFEd cannot solve the global education crisis alone. Governments need to pursue wider reforms that focus relentlessly on quality, equity, and results. But, at a time of fiscal austerity in donor countries, the IFFEd is a piece of smart financial engineering that could to stretch donor dollars further and support reform. Money is not enough to ensure a quality education for all. But money matters, and the IFFEd initiative will help finance investments that could unlock the potential of children who have been left behind. As Franklin recognized, the returns on those investments will be enormous – as will the costs of inaction.